Verizon is relying more than ever on measurement to assess the success of its media relations efforts. 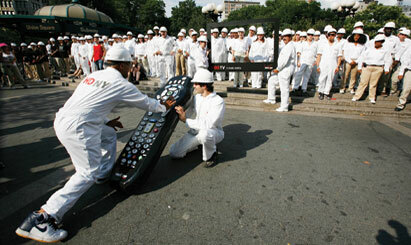 On July 28, 2008, Verizon launched its FiOS TV service in New York City with street events and a news conference. The media relations effort began in the months leading up to the launch and continues to this day. FiOS TV is available in select locations across New York's five boroughs (and parts of 13 states), but will expand to all of the city's 3.1 million households in the coming years, neighborhood by neighborhood. Each new expansion is treated as a “mini-campaign,” with its own media relations activity. Working with Dow Jones Insight since June 2008, Verizon is measuring the effort every step of the way. The media measurement effort at Verizon (which accounts for between 5% and 10% of Rabe's budget, with costs shared among other units) is a mixture of hi-tech text mining and low-tech human analysis. It is executed down to a local level to ensure that each media relations dollar is spent wisely. Verizon measures a number of qualities, including share of voice, favorability of coverage, and coverage of competitors across print, online, and broadcast outlets, with scores assigned to calculate the value of the media hit. This can't be done for every article, so a subset of primary media is determined. Mixing the quantitative and the qualitative, the company is watching to make sure that the messaging surrounding its FiOS TV product is reaching the media and, in the end, potential customers. That messaging revolves around three ideas: technical superiority of the offering; more programming, particularly in HD; and greater value. “In tracking [message penetration], we are seeing that the message is well-received, reiterated, picked up, and reflected back at us,” says Rabe. All this involves a certain amount of subjectivity. While the measurement program is meant to quantify media relations' impact, Rabe knows that some things can't be numerically pinned down. After working with a couple of other measurement services, Verizon selected Dow Jones Insight largely because of its ability to gather media information from small geographies. “We worked together with them to determine who their team was reaching out to in terms of reporters and outlets,” adds Matt Donahue, media consultant with Dow Jones Insight, who oversees the project. Donahue's team worked with Verizon to pinpoint key performance indicators – volume of coverage, tone, and comparison with peers – that would determine its media messaging's impact. The system was operational by July. “Taking a market like New York with a broad set of publications, we worked with them to make sure we were getting content from the right sources... that [were] talking about local communications market data [concerning] the FiOS installation,” Donahue adds. Verizon conducts its own analysis based on information provided by Insight, which is available on a daily, weekly, and monthly basis. Verizon also does periodic surveys to track whether consumers have a favorable image of the product and to see how the product can benefit them. The company has run into an issue with a geographic area outside New York (Rabe declined to identify it for competitive reasons) where, Rabe says, customers seemed to have an issue taking “the next step – [and asking] why I should buy the product.” The company is using measurement to guide its messaging to this area going forward. Otherwise, the measurement initiative has demonstrated the success of the media relations effort so far. Primary media hits for FiOS TV spiked to nearly 200 on launch day (indicating a “good success”) and then fell before it normalized at about 130 for the three weeks after. Verizon received 70% share of voice in the month surrounding the launch when FiOS TV is placed side-by-side with its biggest New York metropolitan rivals, Time Warner Cable and Cablevision. The title of this story appears in print as "Making a connection."